At La Romareda, one of the most difficult stadiums in the League, Gerard Lopez’s Barça B side began the year with a well earned point. Abel Ruiz opened the scoring on 55 minutes for the visitors, but Guti, on 64, ensured that their joy was short-lived. Despite the intense rain, which didn’t allow the ball to run well in some areas of the pitch, the players managed the best they could in the opening exchanges. 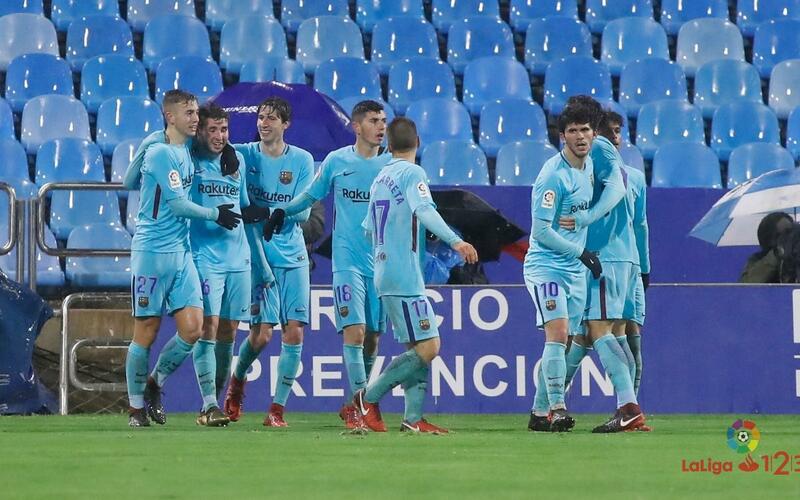 The first clear opportunity was a shot from Zaragoza’s Pombo which hit the post, but little by little, the Blaugrana eased their way into the game, mainly thanks to great combination play from Abel Ruiz and Vitinho. A double shot at the end of the half from Aleñá and Ruiz de Galarreta was the nearest they came to opening the scoring. Mujica replaced Choco Lozano at the break, and Abel Ruiz had already served a warning of his attacking intentions to the hosts before his cross-shot put Barça ahead (minute 55, 0-1). Just nine minutes later, however, Guti brought the scores level (1-1), and from then on the Barça players did everything but score. Zaragoza also tried to find the winner but were up against a solid Blaugrana defence. The visitors can be pleased with the point, making it nine draws for the season.